This week is British Tomato Week, I don't know who thinks up these initiatives. The timing is way off, are British tomatoes even in season yet? 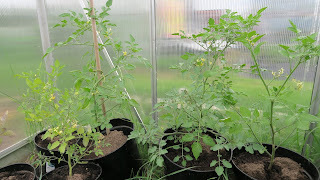 I certainly don't know anyone that has home grown tomatoes ready yet and that includes friends that got an early start with heated greenhouses and grow lights. What I do have a greenhouse full of promise. I went crazy with the tomato plants this year, they are one of my favourite foods and I'm hoping to have enough to make sauce for the rest of the year. I've been rooting the pieces I pinch out to create even more plants. I'm growing seven varieties this year. 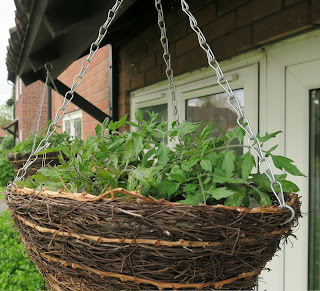 At home I have Tumbling Toms in hanging baskets. 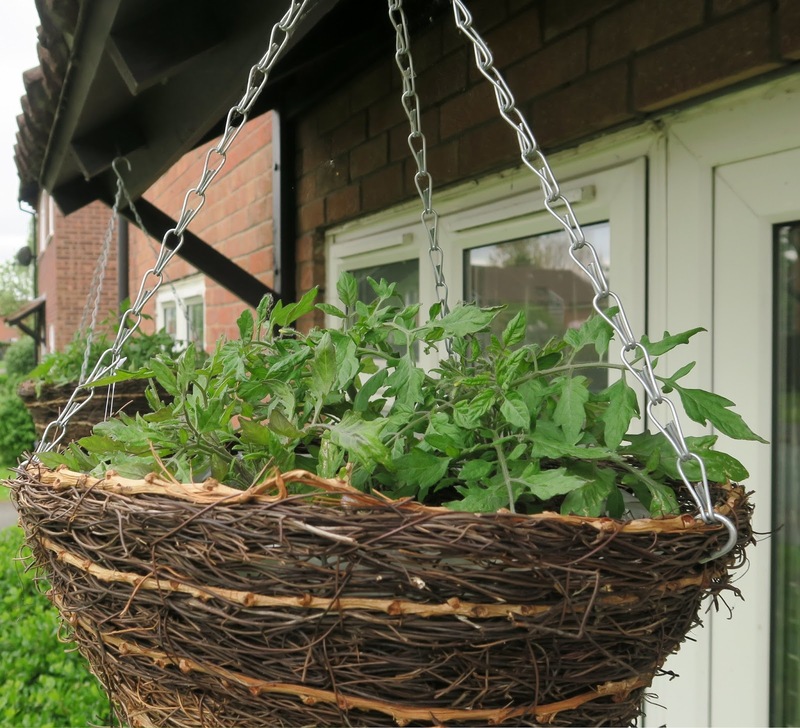 There are three plants in each basket. I bought these as young seedlings from the local garden centre. 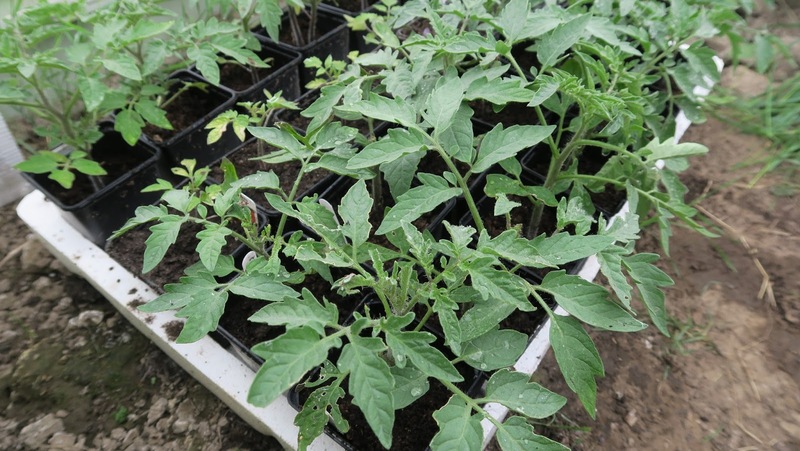 I put them outside straight away and we brought them in overnight several times when there was a risk of frost. 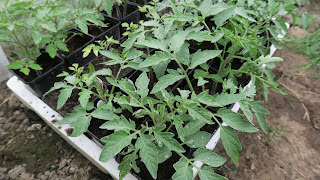 I bought Rob Smith's currant tomato plugs from the Dobies of Devon stand at the Edible Garden Show. It was £5 for 6 plugs. Three yellow and three red tomatoes. I nursed these at home on our bedroom windowsill until the greenhouse was re-glazed in the middle of April. These are the ones that I've been pinching out and rerooting. When pinching out you nip the branch off the main stem. Put the piece that you pinched off into water for a week until it starts to grow roots. Then plant it into compost and you'll have another plant. Those initial 6 plants have now become 12 and I'm sure there will be more cuttings to come. I grew Moneymaker, Harbinger, Roma V, Shirley and Gardener's Delight from seed these are all in the greenhouse and looking good. I have six of each plant and I'll soon run out of room as they are all ready to be potted on. I'm going to try half of the plants outside. This is a bit of a risk as our weather is so temperamental and if the temperature drops too low they'll struggle. There are also far more pests outside that are likely to attack them but I'm told that outdoor tomatoes have a much sweeter flavour. 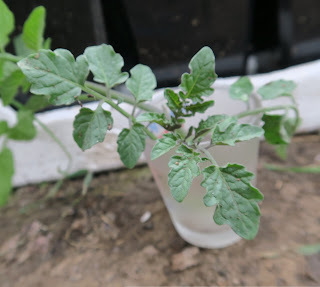 My final tomato was a gift from my Mom and it's going to have black and white tomatoes growing on the same plant. This is grafted plant again from Sutton seeds. It doesn't seem to have grown much compared to the other tomatoes but I'm excited about it just for the novelty factor. There was one more variety that I really wanted to grow this year but I never quite got around to getting the seeds ordered and that was the heritage Amish Paste. It was recommended to me by a fellow YouTuber who raved about the wonderful flavour after growing them last year. 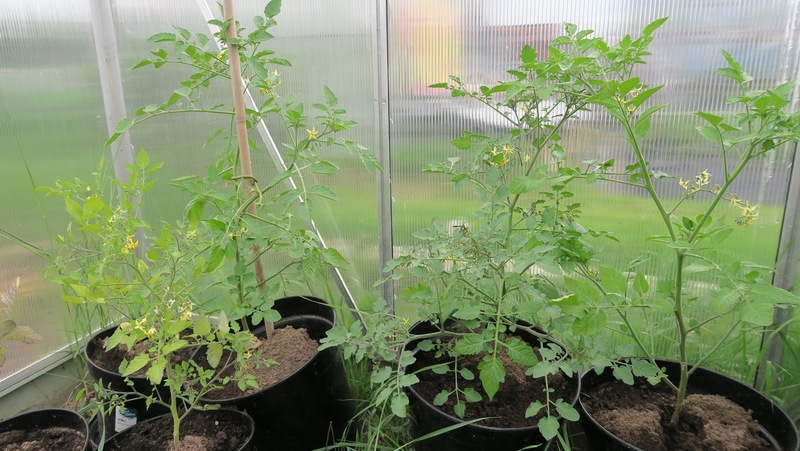 What tomatoes are you growing?